SHOES are my weakness — as they are for most women. Marlene Dietrich famously once said, “Shoes are more important than suits and dresses. Buy one good pair of good quality instead of three pairs of bad quality”. You know what? She’s right. However, a friend recently asked me if she should throw out her old shoes or get them repaired. If they are good quality shoes, absolutely get them repaired — but only if they’re worth it. If the soles or heels need repairing, that’s easy to do. But if the uppers start cracking, then it’s not worth getting them repaired. Once the uppers go, the shoes have seriously passed their use by date, so toss them out. You may think that you’re saving money by paying $50 to repair them instead of buying a brand new pair. But they will probably need more, equally expensive repairs before long. And if you paid $30 for the shoes, then they probably weren’t meant to last. So why bother; the repairs will probably cost more than you paid for them. Shoe repairs in the range of $30-50 can give them several extra years of life, and leave you feeling like you have a brand new pair of shoes. Quality will always outlast quantity, which in time is more cost effective. So always buy the best quality shoes you can afford as they should last for years — not just a single season. That way you get a great return with your cost per wear ratio. This logic can be applied to everything! You can also extend the life of your shoes if you look after them. I have shoes in my wardrobe that are more an 15 years old and are still in great condition because I’ve looked after them. Yes, I’ve bought wisely — I never used to — but I’ve also invested in my investments. Check your shoes and boots every season. Do they need re-heeling or re-soling? Or just a good old “spit and polish” to breathe new life into well-worn leather? There is nothing worse than seeing a well-dressed woman — or anyone for that matter — with badly scuffed shoes and damaged heels. Trust me, you can tell a person by their shoes. So don’t let your shoes let you down. That’s why it’s so important to find a good cobbler who will care for your shoes and make him your best friend. 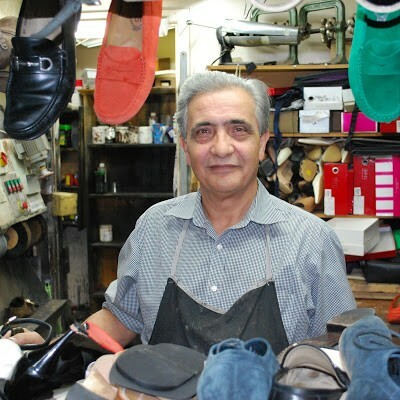 I’ve got mine — Rocky Reale (above and below), of Double Bay Shoe Repairs in Double Bay. Rocky’s been taking care of all my basic shoe repairs —re-heeling, re-soling and modifying my shoes — for years. NO, this is not a sponsored post — just some good old-fashioned advice. Rocky is an old-style Italian cobbler who is passionate about what he does. He appreciates quality, but more than anything he appreciates people who appreciate what he does. Every winter I take my boots to him so he can do a “spit and polish” – reheeling and general polish. I have a pair of Sergio Rossi boots which are 20 years old. And after Rocky performs his magic they look like new again. Seriously! And, because the boots are plain and classic in style, they won’t date. As long as Rocky works his magic! Prolong the life of new shoes by applying a Topy sole (an antislip sole) immediately before wearing them. This is most important at this time of year. When leather soles get wet, they stretch. When they dry, they shrink. With this constant wet and dry process, the soles will eventually crack and become misshapen. Always spray suede shoes with a waterproof protector spray, especially before wearing. Always polish leather shoes as the salt in sweat dries out leather over time. Regular polishing keeps it supple. Keep your shoes in their dust covers (if provided) in their boxes, stacked neatly in your wardrobe. Keeping shoes in their boxes also keeps the rather offensive sweaty shoe leather smell permeating through your clothes. But if you don’t remember what shoes are in what box, take polaroids or pictures of your shoes and stick them on the outside of the relevant shoe box for easy identification. Alternatively, try these clear shoe tidies by Pink Lily. To repair scuffs on patent leather shoes, colour the spot with a marker pen the same colour as the patent leather. Once the colour sinks in, paint over with a very light coat of clear nail polish. Or buy a special patent leather shoe polish. Shoes need to breathe between wearings. So try an alternate your shoes. Don’t wear the same pair Every. Single. Day. If your shoes get wet, let them dry — naturally. But NOT in front of a heat source. Clean the insides. This is especially important if odour is a problem. Swab them with alcohol or a drop of tea tree oil, an antifungal agent, taking care not to stain the leather. Wear little sock liners. This will protects against perspiration, which erodes insoles. What is the right dress style for your body shape?